“With almost every bone in the body represented multiple times, Homo naledi is already practically the best-known fossil member of our lineage,” said Lee Berger, research professor in the Evolutionary Studies Institute at Wits University and a National Geographic Explorer-in-Residence, who led the two expeditions that discovered and recovered the fossils. H. naledi was named after the Rising Star cave — “naledi” means “star” in Sesotho, a South African language. “Overall, Homo naledi looks like one of the most primitive members of our genus, but it also has some surprisingly human-like features, enough to warrant placing it in the genus Homo,” said John Hawks of the University of Wisconsin-Madison, US, a senior author on the paper describing the new species. “H. naledi had a tiny brain, about the size of an average orange (about 500 cubic centimeters), perched atop a very slender body.” The research shows that on average H. naledi stood approximately 1.5 meters (about 5 feet) tall and weighed about 45 kilograms (almost 100 pounds). This contrasts with the feet of H. naledi, which are “virtually indistinguishable from those of modern humans,” said Dr William Harcourt-Smith of Lehman College, City University of New York, and the American Museum of Natural History, who led the study of H. naledi‘s feet. Its feet, combined with its long legs, suggest that the species was well-suited for long-distance walking. “The combination of anatomical features in H. naledi distinguishes it from any previously known species,” added Berger. Perhaps most remarkably, the context of the find has led the researchers to conclude that this primitive-looking hominin may have practiced a form of behaviour previously thought to be unique to humans. 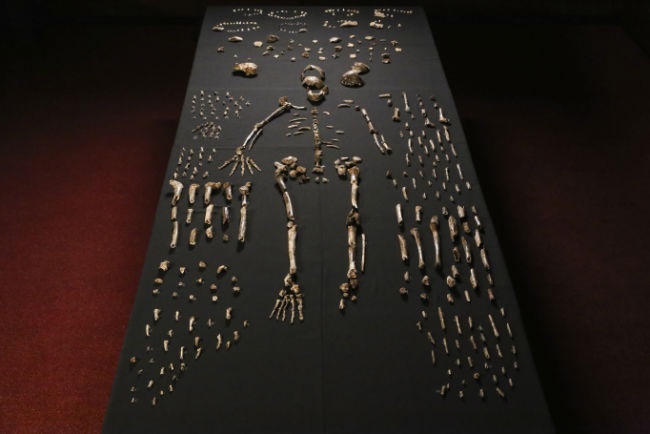 The fossils — which consist of infants, children, adults and elderly individuals — were found in a room deep underground that the team named the Dinaledi Chamber, or “Chamber of Stars”. Elliott was one of six women selected as “underground astronauts” from a global pool of candidates after Berger issued a call on social media for experienced scientist/cavers who could fit through the 18-centimeter(7-inch)-wide cave opening. Social media continued to play a role in the project, as the team shared expedition progress with a large public audience, schoolchildren and scientists.